You have probably heard by now that today Illinois is holding its primary election, and, guess what? You can do same day voter registration, if you’re not already registered! Though you most likely decided who you want (or definitely don’t want) for ‘big’ races like U.S. president and Cook County State’s Attorney—the latter of which another Gozamos contributor addressed in a recent article—there are almost two dozen other important positions listed on our ballots. The people we elect locally, arguably, have more power to affect our day-to-day lives, but many of us are less-than-informed about some of these candidates, such as those running for judicial positions. One nice thing about trying to select which judicial candidates to vote for is that there is much more accountability and objective information out there. Bar associations do extensive investigations and provide ratings and detailed reports for each of judicial candidate, which can be very helpful to voters. The Chicago Council of Lawyers provides a sample ballot that summarizes all of their ratings (hint: you can bring this and other resources with you to the poll!). 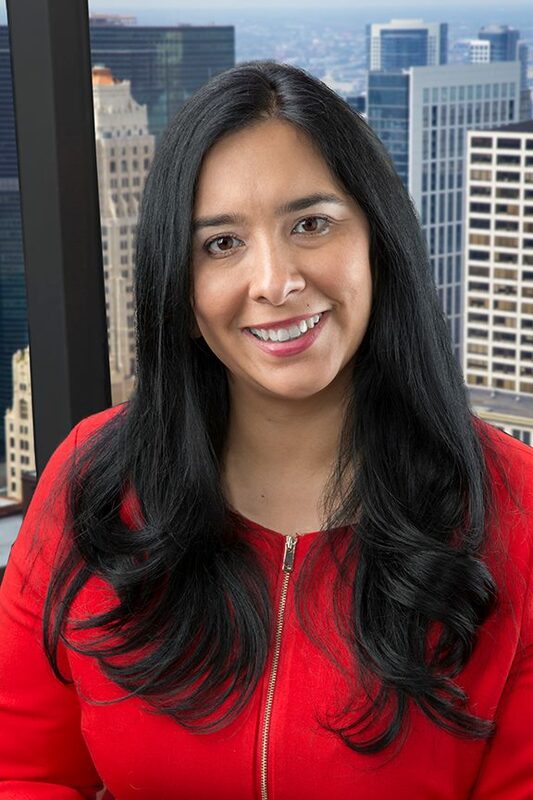 Rosa Silva is one of six candidates running for a 7th SubCircuit–Rivkin-Carothers judicial seat in Cook County, and one of only two candidates that was rated as ‘qualified’ or ‘recommended’ by all twelve bar associations in Illinois. The 7th subcircuit of Cook County includes sections west of the Loop, northwest side and west suburban Cook County. (See the Voting Resources at the end of this article for information on finding your subcircuit.) 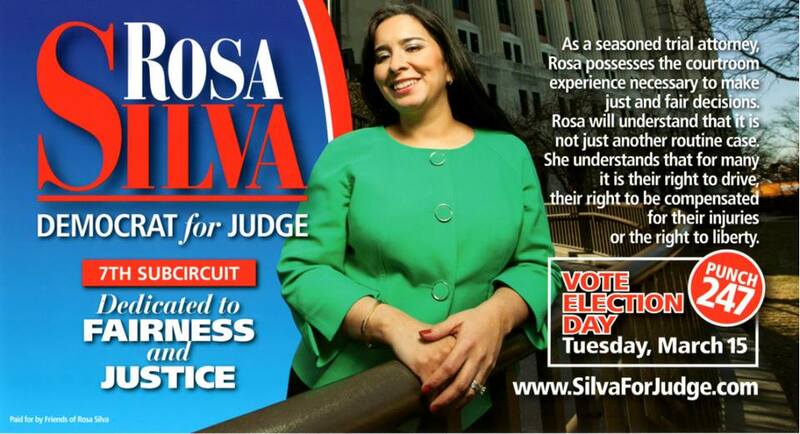 Silva’s slogan is “Save the Best, for Last,” as she is the at the last name on the that section of the ballot, #247. After putting her two year-old to bed after a long day of working and campaigning, Rosa Silva was kind enough to take the time out to talk with me about her work and why she is running to be a judge. “Overall, I want to make sure people have equal access to justice, so that everyone feels that they are treated with respect and dignity when they come to court,” Silva said. “I’m not going to say that [being a judge] is a great power, but it’s a great responsibility because people’s lives can basically depend on a [judge‘s decision].” Silva has been practicing as a public defender for over 14 years, and her experiences in that very demanding work inspired her to run for a judicial position. She witnessed first-hand over countless cases the capacity of the judges to affect change on a larger level, but also in a way that also affects individual people’s lives. Throughout her years of defending people who couldn’t afford a lawyer, Silva also saw a need for diversity in the legal system. “I’m very committed to social justice issues and diversity, and [believe] the bench should be a diverse group of people; I think I have the qualifications and dedication to be part of that group,” she said. In addition to an ethnic, racial and gender diversity, Silva also refers to a legal one. The vast majority of judges come from a prosecution background, so Silva’s background in defense litigation has given her a viewpoint that is much more familiar with the experiences of everyday people trying to navigate the complex and daunting legal system, going up against attorneys and judges whose background in prosecution may make them less-than-inclined towards alternative sentencing over prison sentences. Though I’m too cynical to believe that having more smart, compassionate people in the legal system could ever fully correct all of the many detriments of the prison-industrial complex, it is still obvious that people can do great work to reduce harm and affect real, positive changes in people’s lives and in communities from within that system—especially when they are able to provide crucial diverse perspectives based in hands-on experience. If elected, Rosa Silva wouldn’t be able to choose if she presides over criminal or civil cases, but it seems fair to say that her years of work as a public defender have given her an in depth look at the legal system, who it works for, and in what ways should be more fair, accessible and accountable to everyday people, regardless of background or whether they have thousands of dollars for a lawyer. Though Silva’s other official campaign slogan, “Dedicated to Fairness and Justice,” is in fact just a slogan, in this case there does seem to be a lot of truth behind the words. Author’s note: As a collective and a grassroots organization, Gozamos does not formally endorse any political candidate. We are a space for our contributors and readers to provide their perspectives and engage in discussion—political, cultural or otherwise—and generally encourage our readers who can vote to read up on candidates and exercise that privilege. Yet, we recognize that voting in elections is limited and is just one of many ways to exercise one’s democratic rights and enact positive change in our communities.